Unilever (NYSE:UL) is one of those handful of stocks where the sheer size, diversity and quality of their brand portfolio means you never really have to worry about the underlying business. It rightly goes alongside global peers like Nestlé, PepsiCo, Coca-Cola and Procter & Gamble in ticking all the criteria for being perfectly suited to a long-term dividend portfolio. Does it operates in a stable sector with durable competitive advantages? Check. Does it have a long history of profitable enterprise? Check. Does it have a long history of paying out a portion of those profits as dividends to stockholders? Check. The only thing you really ever have to take care of is making sure that you don’t overpay too much for the underlying business. As usual with the consumer defensives Unilever’s earnings quality all comes down its brands. In total the company boasts over four hundred of them with fourteen generating over a billion dollars in annual revenues. Just to put that into context the king of non-alcoholic beverages – The Coca-Cola Company – sports a total of about five hundred brands with twenty of them worth at least a billion dollars in annual revenue. Among the well known names that belong in the Unilever tent are Lipton, Axe, Surf, Flora, Dove and Magnum ice-cream. These are the kinds of brands that just litter homes across the globe. According to their corporate factsheet the company boasts the global number one position in tea, ice cream, spreads and deodorants (among others). It’s the world’s number two in laundry and daily hair care products. It’s almost impossible to imagine how you can degrade that associated earnings power considering just how stable and diverse the product categories are. And what do these products all have in common? It’s that they aren’t going anywhere anytime soon. Take Unilever’s ice-cream segment for example. Between the late 1950s and 1980 the company went on a spree of acquisitions of smaller ice-cream companies, having identified it as a sector with long-term potential and relatively high returns on capital. By the late 1970s the company had built up a 30% market share in Western Europe. That was forty years ago. Today their global market share in ice-cream is over the 20% mark courtesy of brands like Ben & Jerry’s, Magnum, Carte D’Or and Wall’s. I’d imagine that in the next forty years those brands will still be on display in supermarket freezers across the world. That’s the nuts and bolts of the underlying business. It’s all about selling goods that people will be buying week in, week out fifty-two weeks a year. Apply that principle across their operating segments – Personal Care, Foods, Refreshment and Home Care – and in total it all adds up to a consumer powerhouse that now rakes in over €50bn in annual revenue. They convert about 10% of those sales into net income every year, with those after tax earnings accounting for approximately 50% of actual tangible capital such is the extent of their brand equity. So that’s Unilever the business. It’s super high quality and its defensive by nature – great for a long-term dividend stock portfolio. Now let’s look at the stock. The thing to bear in mind with Unilever stock is that investors have benefitted from the perfect duo over the medium-term: solid earnings growth and an expanding value multiple. Actually you could apply that principle to a bunch of other super high quality blue chip consumer defensive stocks as well. Kellogg Company, Coca-Cola, PepsiCo, Procter & Gamble, Reckitt Benckiser, The Clorox Company, General Mills, Nestlé and L’Oréal are all trading at well over 20x earnings. Those are just the ones I can think of too. Let’s look at Unilever stock though. Back in 2000 the company earned net income of $0.96 per ADR and the average P/E ratio for the year was about 15.5. This year investors are looking at $6.20bn in net income, which will equal about $2.10 per ADR. The average P/E ratio so far in 2016 has been about 21.5. Over that time Unilever’s stock price has gone from $16 to $46 – or about 6.67% per year on average. In addition we have the juicy dividends that the company have paid out in that time period. Back in the good old days when the valuation multiple was lower you’d be picking up 4% on the stock through the dividend alone – pretty much guaranteeing you decent returns in the process. 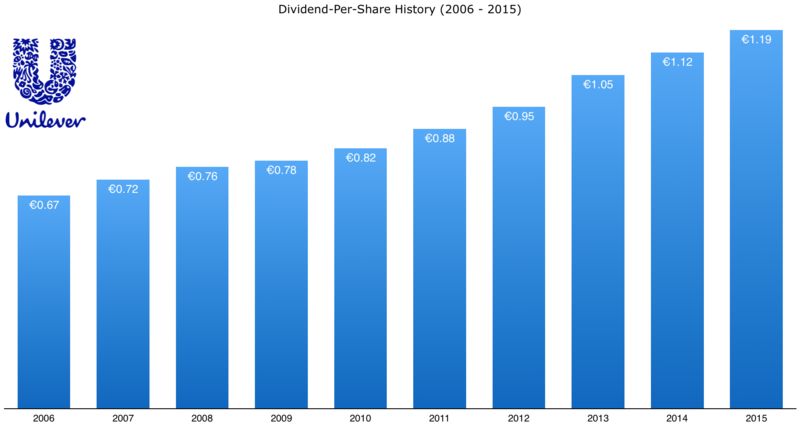 In total those dividend checks add up to around $15.34 per ADR since 2000. Add that to the total returns and you get a compounded annual figure of 8.75%. No doubt about it those are good medium-term returns for a stodgy defensive giant; the equivalent of turning $50,000 into $191,750 in the space of a little over 15 years. To get some feel for how much expanding valuations have contributed to those returns let’s take it right out of the equation. Imagine if Unilever’s P/E ratio hadn’t budged at all between 2000 and 2015: your returns were solely from earnings-per-share growth and from the dividend distributions. Had that scenario occurred you’d be looking at returns on that $50,000 investment of $150,000 assuming the dividends accumulated. Compare that to the $191,750 figure quoted above and you see that it’s a huge contribution. The downside for investors today is if that works in the opposite direction going forward. In other words you see the underlying business carry on doing well – with earnings-per-share growth coming it a solid clip helped by occasional share buybacks – but your Unilever stock returns get muted because the value multiple goes in the opposite direction. As I’ve written on this site a few times there are some stocks where you should just take that out of the equation by committing to a regular investment program. Unilever stock is one of them. The underlying cash generative nature of the business means you’re almost guaranteed to be collecting dividend checks in a few decades time.